This training is not for everyone. It's going deep, based on the ancient original roots of yoga. You will spend five life-changing weeks together as a sangha, a spiritual community, guiding you to be ready for the deep end that becoming an authentic and successful yoga instructor is. Kaivalya Yoga School offers a proper education in the practice and theory of the age-old system of yoga, its various parts, and how they were originally taught. 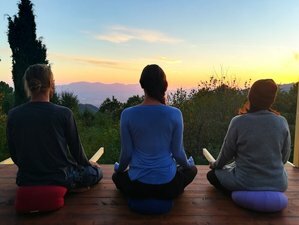 Let us take you on a transformative journey through the mysteries of genuine spirituality correlated to Western science and thinking, offering comprehensive explanations and pedagogically sound techniques, while giving personal guidance and support on your path towards excellence on all levels. This teacher training will take place at The Inner Peace Sanctuary in Tuscany, Italy. The sanctuary is a traditional Tuscan country residence tucked away on a hill covered in chestnut forest. It offers a feeling of truly being away from it all ,while still being able to reach civilization in a mere half hour. It's dedicated to spiritual practice, retreating into yourself and living a healthy lifestyle in a small supportive community. During this training, you will stay either in a private or a shared accommodations. The Inner Peace Sanctuary has several twin and double rooms, a six-bed dorm, as well as large, well-appointed glamping tents in the garden, all created with comfort and traditional beauty at heart. This training is for those who would like to teach yoga from spiritual experience, going into their own depths, becoming confident, fearless, inspiring in the process. Those who feel an urgent desire to explore the truth of existence by studying and practicing a wide range of knowledge and techniques from ancient wisdom traditions passed down to us through the ages by highly evolved beings for the benefit of all. Many other yoga teacher training courses offer quicker programs, over three or even two weeks, with less actual contact hours in the classroom, requiring students to complete many hours by themselves to reach the hours required for certification. This course exceeds 200 contact hours, ensuring that you will be adequately prepared to guide future students confidently and successfully. Each course includes a special module on a yogic topic to go deeper into. For the July course, in 2019, we will go into four powerful days of Silent Meditation Retreat, a practice that has always counted as a key to discovering the deeper layers of ourselves and existence at large. The September course features a 4-day Bhakti Yoga module, giving space to the Yoga of the Heart with lots of chanting, mythology, and the science of mantra. On each weekend, we will explore a different part of the surrounding Tuscan towns, including Pisa, Lucca, and Borgo. The last weekend will include an Italian cooking class. All weekend activities are optional. Anatomy of the subtle bodies: chakras, nadis, koshas, etc. Application of anatomic principles to the yoga practice Benefits, contraindications, healthy movement patterns, etc. The course consists of five blocks with two days off in between. Class times are 7 a.m. to 1 p.m. and 3:30 to 6:30 p.m. including the four-day special module in the middle of the course. Every morning you will start the day with a guided session of chanting and meditation to explore your true self with ever-growing awareness and love. You will have two sessions of Hatha yoga each day, one in the morning, to learn and practice new material, and one in the afternoon to develop your own teaching skills. Each day there are discourses covering the different aspects, stages, and practices of yoga and related spiritual traditions and how to teach them successfully and in an inspirational way. In numerous additional sessions we will fill in the gaps and prepare you for all that awaits when finally being in front of your first real-world class. If you already have teaching experience this will help, but you will find an amazing wealth of new knowledge and insight by diving into the realm of traditional yoga. This teacher training is registered with the international Yoga Alliance as RYT-200, graduates are entitled to teach anywhere in the world. In order to receive the yoga instructor certificate they require successful completion of the whole course with at least 95% attendance, holding of an acceptable practicum class, and passing of the final exam. After they issue your certificate you are entitled to apply with Yoga Alliance to be added to their directory. Excursions to explore the local Tuscany including Pisa, Lucca, and Borgo are included in this course. Arjuna has been studying and practicing eastern spiritual traditions in India, Thailand, and Europe for over 15 years. He started his path and deep soul journey in his early twenties when he discovered Theravada Buddhism and Vipassana meditation along with Sivananda yoga. Apart from practicing Hatha yoga and meditation, he is a fiery bhakta, immersed in devotional songs and chants most of the time. He aspires to bring awareness and love into every breath. From the heart, he would like to offer his deepest gratitude to all his beloved teachers across the world. Arpita (MA Eastern Studies) is a dakini with many facets. Sometimes scholar, sometimes worshipper she combines wisdom traditions with devotional practices into One. In her late teenage years, she started a formal practice of yoga as a student in the Satyananda tradition, which inspired her with its traditional approach to the ancient science and wisdom of yoga. Her passion is to teach by example, to open her Heart to every moment and let it pass right through her until there is nothing left but Everything. The kitchen provides three delicious and wholesome vegetarian meals on all course days: fresh local ingredients, fruits, and vegetables from the sanctuary garden crafted into balanced recipes supportive for spiritual practice. During your free time, you may enjoy walks in the forest, explore the location on your own, enjoy the sauna, or simply relax. There will be weekly sauna sessions at the sanctuary. Please book your flight to arrive at Pisa International Airport (PSA). Transfer from this airport is included. We will pick you up from the airport on arrival day at 4:00 pm. Alternatively we can also pick you up from the nearest train station, please coordinate it with us. The rest of the payment should be paid 180 days before arrival. Love · Evolve · Awaken offers various yoga and meditation retreats, yoga teacher training courses, weekly kirtans, workshops, and intensive courses. Shared house - Early bird discount. Bell tent or yurt in the garden. Early bird discount. Shared house - Shared bathroom. Early bird discount.